Krohn Industries Acquires the Cohler Brand - Krohn Industries, Inc.
We are proud to and excited to announce, that Krohn Industries has acquired the Cohler Brand of plating products. 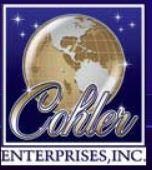 Toby and Joseph, of Cohler Enterprises, will be working with us throughout the transition period to ensure a smooth transfer. We feel this is a natural fit for their customers and products as both companies are family owned and operated, sharing the same high standards of quality products and excellent service. Krohn will deliver the same Cohler formulations and products that are loved and trusted throughout our industry.